Earlier this month, we announced a new resource for the ASpace community: Awesome ArchivesSpace https://github.com/archivesspace/awesome-archivesspace. 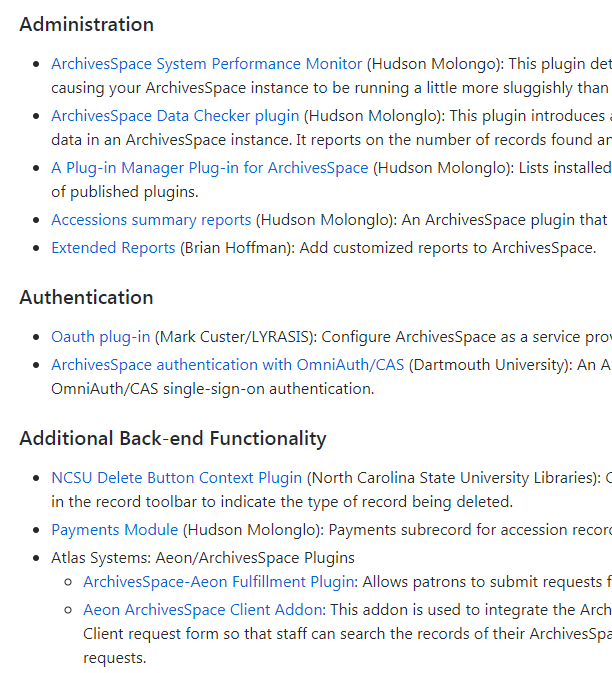 Awesome ArchivesSpace is an awesome list. It points to resources (code, blog posts, slide decks, journal articles — anything with a URL, really) regarding ArchivesSpace created by the community that are dispersed around the web. 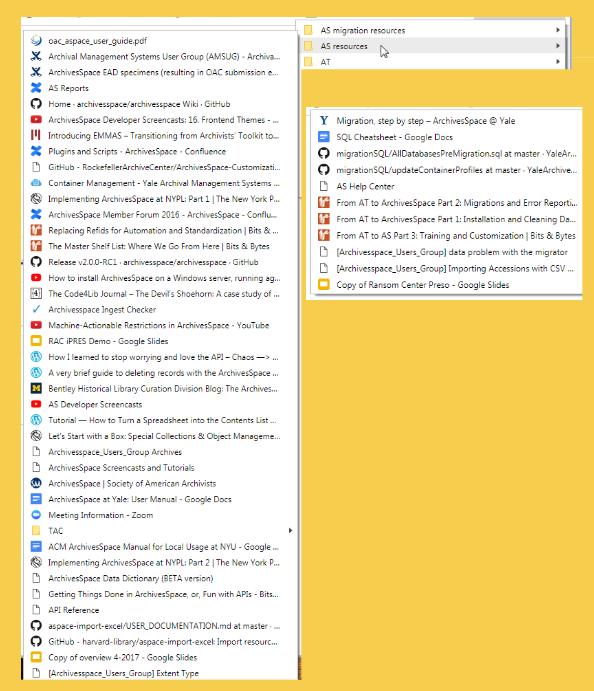 Partially inspired by my own out-of-control ASpace bookmark folders (pictured below on the left), we hope this will function as a sort of “resource guide,” by providing a single, up-to-date access point to many of the amazing resources you’ve all created (below on the right). Resources in the list are loosely categorized by broad topic. We initially identified and populated three categories of resources: Migrations, Plug-ins, and Integrations. Through that work, three additional categories of interest were identified: Implementation, Scripts and APIs, and Trainings and Documentation. Those new categories were out of scope for our working group, but we added the headings with a few starter links to encourage the ArchivesSpace community to fill them up with more resources. We encourage everyone to add links to existing categories as well as suggest new categories. The ArchivesSpace community has ownership over Awesome ArchivesSpace — please help us continue to collect and add relevant resources to Awesome ArchivesSpace! You can suggest links to add and recommend removing outdated links. See the Contributing Guidelines for information on how to update the list via a pull request or, if you’re less familiar with GitHub, you can suggest a new link by creating an issue. While the Technical Advisory Council (TAC) has several standing sub-teams, TAC began experimenting with ad hoc working groups during this past year to carry out time-limited projects with narrower scopes. These groups are open to members from any sub-team and even members of the ArchivesSpace community that are not on TAC. As a whole, we really enjoyed being a part of the working group and we hope this can be a model for other TAC projects in the future. We hope you find Awesome ArchivesSpace to be useful. Please reach out if you have any comments or questions — we welcome your feedback! Maggie Hughes is the Collections Data Archivist at UCLA, where she oversaw their migration from Archivists’ Toolkit to ArchivesSpace earlier this year. Maggie led the Awesome ArchivesSpace Ad Hoc Working Group and serves on the Integrations and Migrations sub-teams of the ArchivesSpace Technical Advisory Council. All About Community is a blog series that highlights the many teams and groups that contribute to the growth and development of ArchivesSpace. This series aims to provide insight on how our diverse community comes together with a shared vision to preserve permanently valuable records and provide access to our researchers. ← Annual Member Forum – reception announcement!